Arriana Valga is the widowed Countess of Chorrol. Her deceased husband, Charus Valga, the hereditary Count Chorrol, was slain in battle against Nord clansmen from Skyrim. She is the mother of Alessia Caro, who is the wife of Marius Caro, the Count of Leyawiin. Someone recently stole a painting of her husband, and she needs someone to investigate the crime during Canvas the Castle. At 6am the Countess will wake up and have breakfast in the dining hall. Two hours later she will finish her meal and head to Castle Chorrol Great Hall for court attendance. She will hold court until 6pm. She will then head to her private quarters for the next two hours, after which Countess Arriana Valga will return to the Great Hall for the royal feast. She will attend the banquet until midnight, at which time she will go to bed to rest for the next six hours. 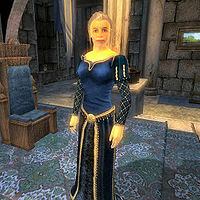 As the Countess of Chorrol, Lady Valga treats herself to the best Cyrodiil has to offer, namely an upper-class blue velvet outfit and matching blue suede shoes. She carries a green silk garment, her key, the key to her quarters, a key for Castle Chorrol's Private Quarters, a piece of leveled high class jewelry and a large amount of gold. If you have completed the mission Sins of the Father by giving the Honorblade of Chorrol to Laythe Wavrick, she will carry it around. If you meet her for the first time, she will politely introduce herself: "It is a pleasure to meet you. I am Countess Valga of Chorrol. I wish I had time to chat, but I'm afraid I am in the middle of an investigation." Asking about Chorrol, she will express enthusiasm: "We're a mountain people, tough, independent. County Chorrol is rich in mines and timber, wool and mutton, and hard-working people." Asking about High Chancellor Ocato, she will explain his importance: "As the head of the Elder Council, High Chancellor Ocato is the de facto ruler of the Empire for the time being." If you're interested in buying a house in Chorrol, Arriana is selling Arborwatch, which is located between Francois Motierre's House and the Mages Guild. Although she won't offer to sell it if her disposition is below 70 and your fame is lower than 12: "Sorry. I'm looking for someone with a bit more renown. If you become suddenly [sic] famous, I would be glad to reconsider." If the conditions are met however, she'll be glad to offer: "You are? There is a positively gorgeous home for sale right on the main plaza. You'll be hard pressed to find a nicer home for sale in Cyrodiil." If you accept to pay 20,000 gold, she will be delighted: "It's a pleasure to have you become a citizen of Chorrol. I'll take care of the deed. Here is your key. The house is on the main plaza, between the statue and the Chapel. The last tenant of Arborwatch has cleaned the place of furniture. I'd recommend stopping by Northern Goods and Trade. The owner, Seed-Neeus, should have everything you need." If you're not ready to buy, she will be very disappointed: "That's too bad. I was so looking forward to you living in the city." If you tell her you don't have 20,000 gold, she will be irritated: "Well I'm certainly not about to lower the price." During Allies for Bruma, when you ask her to send help with the Oblivion Gate still open, she will refuse: "While I understand Bruma's need, Chorrol's own defense must come first. I cannot spare any soldiers as long as Chorrol remains under threat from the Oblivion Gate outside our walls." After the gate has been closed however, she will gladly assist you: "Your reputation precedes you, Hero of Kvatch! You have done my city a great service by closing the Oblivion Gate. I will now gladly send soldiers to aid in the defense of Bruma. Consider it done." Other than the quest-specific greetings, she may greet you with: "I am Arriana Valga, Countess of Chorrol." The nobility appear to be very pleased with Arriana's rule: "Chorrol appears to be clean, prosperous, and well-ordered. Countess Arriana, her staff and guard is to be praised. "; "If Countess Chorrol is any example, dignity and piety may indeed bring rich rewards from the Nine. "; "I had a very pleasant visit with Arriana Valga recently. The castle was very comfortable, and her new guard captain seems to be working out well." or "Millona Umbranox, Arriana Valga, and Narina Carvain seem to rule their counties perfectly well without male assistance." Asking about the investigation she mentioned, she won't provide any details if her disposition is below 50: "I'm sorry, but the investigation is a secret, and I don't trust you enough to discuss it with you." Otherwise, she will trust you: "You seem the trusting type. Perhaps you can assist me? It seems someone has taken away an heirloom that is quite dear to me. I want you to help me recover a stolen painting. The painting was of my lost love, the Count Valga, and it has been stolen from my bedchamber. If you find the painting, and bring the culprit to justice, you shall be justly rewarded. What say you?" If you say no, she will express her concern on the matter: "Very well. Then I must find someone else who can. I will do nothing else until that painting is recovered." Saying yes will start the quest, and she will grant you access to areas in the castle normally restricted to mere citizens: "Very well, I suggest you begin to gather clues. And I warn you: do not accuse the wrong person, or I shall be quite cross with you. Here are some keys. They should allow you access to many of the restricted areas in Castle Chorrol.". The people of Chorrol may have been talking about the Countess being robbed: "I heard that the Countess is quite upset lately. Apparently someone stole something very personal to her." When you ask her about the painting in particular, she will express the emotional value of it: "The painting is all I have left that reminds me of the Count. I spend many a lonely night wishing that the words I speak to it will be heard and not just fall upon the lifeless pigments and canvas." You can ask her about gathering clues: "Your best bet is to speak to residents of the castle. Once you have found out all you can, search for physical clues." After that, asking about clues she will provide possible suspects: "I was elsewhere at the time of the robbery, and the chamber was locked. The only other people who had access to the chamber and were unaccounted for are the court mage, Chanel and the porter Orgnolf. Don't forget to check with Bittneld, the Captain of the Guard, my Steward, Orok gro-Ghoth and my herald, Laythe Wavrick." When you ask her about the castle residents, she will reveal some valuable information: "Chanel and Orgnolf both reside in the Private Quarters section. They have been restricted to remain indoors, so they should be easy to find. You may also want to speak to Bittneld, the Captain of the Guard. He can be found on patrol in Chorrol or in the Barracks. Finally, I would try speaking to Orok gro-Ghoth who is my Steward. He resides in the Private Quarters section as well. If he isn't in the castle, he may be at the Northern Goods and Trade buying food to stock our larder." When you ask her about accusing, she will tell you what to do: "When you find enough evidence, confront the person whom you believe to be the villain, and see if they will confess. I do not wish them harmed, as I want the thief to face justice." If the Oblivion Gate outside the city is open, some residents of Castle Chorrol may express their disgust of her obsession with it: "I can't believe that the Countess is more obsessed with that painting than the Oblivion Gate threatening the city!" When you've found out who stole the painting, she will greet you with: "Ahhh! You have returned from your investigation, and I am eager to hear the results. Whom did you accuse?" You have two options: tell the truth, or lie. When you tell the truth, she will be grateful: "I am shocked to hear of Chanel's crime, as she has always been such a nice member of our court, but I see that your evidence is without question. She shall be banished from Castle Chorrol and stripped of her duties. However, I am not without pity, and therefore she shall not be jailed. But she is never to set foot in Chorrol again. Congratulations on a job well done." If you accused Orgnolf first, her dialogue will be slightly different: "[...]But she is never to set foot in Chorrol again. I am a bit dismayed that you incorrectly accused Orgnolf, who was clearly innocent. I therefore can only reward you with this gold, and hopefully you will learn to be more careful with your accusations in the future." However, without Chanel's confession, the countess won't accept your accusation: "Chanel? I find that very hard to believe. Until you obtain a full confession from her, I cannot accept your accusation." Lying will result in making the Countess feel guilty: "Oh my. I feel terrible that I even suspected anyone within my court. I was hoping to recover the painting, so I might look upon it again. I suppose you did the best you could, so you should not go unrewarded. Take this gold, and leave me in peace." Saying you're not ready yet will give you more time to decide what to say: "Very well. Take your time." After the quest, if you told her the truth (without having accused Orgnolf), she may greet you with: "It is quite nice to see you again. I hope you are faring well." If you have accused Orgnolf first, she may greet you with: "Hello again. I'm sorry, but I have little time to chat. I am quite busy with affairs of state and all that." If you lied, she will sadly greet you: "Hello. I'm not really in the mood to chat right now." The citizens of Chorrol may talk about the Countess depending on your actions during the quest. If you returned the painting, they will say: "The Countess seems much happier now that the item that was stolen from her was returned." If you lied to her, they will say: "The Countess still seems quite sad. I hear someone tried to find the item stolen from the castle, but they had no luck. Oh well." Canvas the Castle: Someone has stolen a valuable painting from Castle Chorrol! Buying a house in Chorrol: Purchase Arborwatch, a plush house in the center of Chorrol. When you ask her about rumors, Arriana may talk about herself as if she was someone else. This is because many rumors regarding the Countess lack the condition needed to prevent the Countess herself from uttering them. This page was last modified on 17 August 2018, at 18:07.